Whether it’s bass, drums, guitar or piano lessons, at River Studios in Southampton we cater for music lessons for all ages and levels. You can also work through your music grades through the Rockschool (RSL) syllabus should you wish to develop your music grading. Our bespoke music rooms are more than equipped to teach a range of musical instruments from our sought out music teachers. Prices start from £16 for 30 minute sessions leading to £30 per hour. 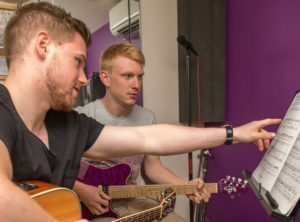 Teaching takes place in both our teaching and rehearsal rooms, which have been designed specifically for musicians and have the relevant equipment to make your lessons go smoothly. All our music teachers have extensive teaching experience as well as all being professional musicians. They are happy to pursue both formal academic paths of tuition (for grades etc) or work purely on improving technique for the pleasure and progress of the student. Every teacher who teachers at River Studios Southampton has been hand picked and trained to ensure every lesson you may have with them will go smoothly and professionally. Did you know we also do guitar lessons, drum lessons and piano lessons at River Studios in Southampton.